Linderhof in 2009 . . . It's fun to look back at 2009 . . . Good food, good friends and good times were always to be had at Linderhof. And it was a busy year. Join me for a Year in Review at Linderhof. And if you want to see what everyone else has been doing in 2009, join Cindy at My Romantic Home. The Christmas Tree -- the biggest part of our holiday decorations! Tea is a ritual at Linderhof and in November we love ginger cookies. We love both the smell while their baking as well as the cookie themselves! An estate sale find -- the German silver. Engraved with my German grandmother's initials. Could it be? The pond with the one eared cat watching out for the fish swimming below. 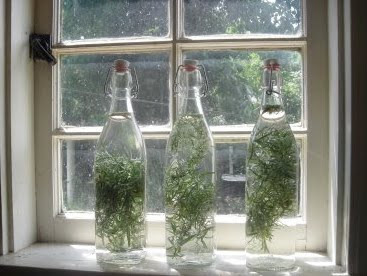 Herbs are preserved in one way or another. The basil is turned into pesto and the tarragon gets put into my homemade wine vinegar. Summer isn't summer without tomatoes and fresh heirloom tomatoes from the prairie are the best. 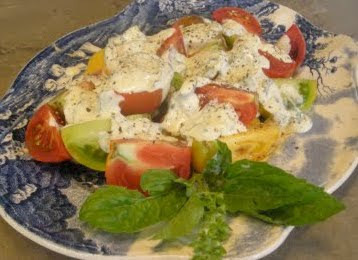 There are few summer meals that aren't accompanied by a plate of sliced tomatoes. 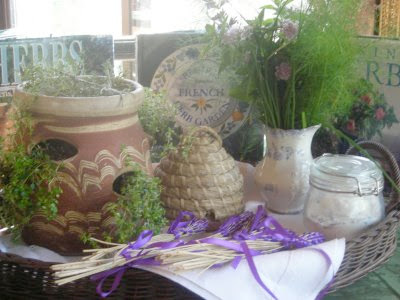 Herbs are a passion and giving herb classes is always fun. I love to share my knowledge of herbs with anyone and everyone! 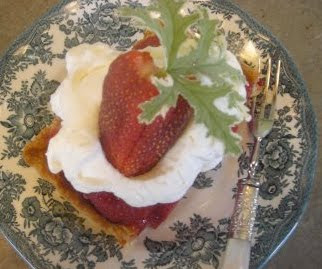 Prairie strawberries are always the best and we can't wait until they come to market. Strawberries in some form are dessert every night until, alas, the strawberries are gone! We can't wait for the first jonquil to bloom. 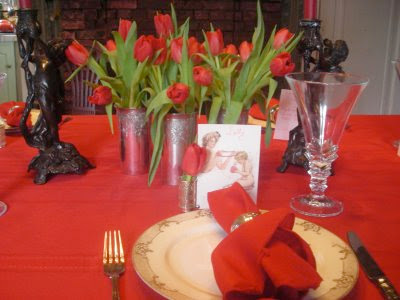 The yard is full and bouquets are brought in every day to decorate tabletops during March. It's so nice to have garden flowers instead of fruit or florist flowers. The Valentine's Luncheon is a gift to my friends. It's a ladies lunch and I enjoy making my friends feel special. Dessert is almost always chocolate! 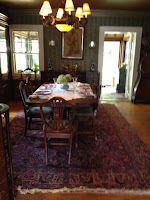 A lady needs a desk and this is where, after breakfast, I take care of correspondence and once a month pay my bills. It looks out over the garden so there is something pleasant to see while I pay the dreaded bills. 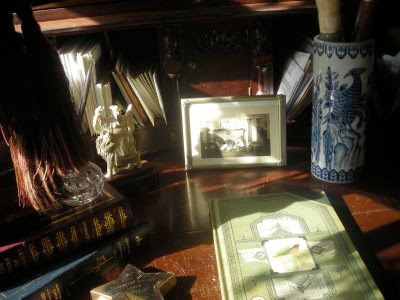 The picture on the desk is a picture of the living room taken in 1930. 2009 was a good year at Linderhof. I'm looking forward to more visits with friends in 2010. Join me at My Romantic Home for the "Year in Review"
Here on the prairie we use the word "Tweener" to define that week "between" Christmas and New Year's. I think it is indicative of prairie speak for I've not heard that week described that way anywhere else. So on Monday after Christmas, the week "between" Christmas and New Year's, we had company at Linderhof. A green tablecloth because it is still the Christmas season, the bowl of Christmas clementines for I love the orange in the blue oriental bowl. Leaves of kumquat and orange tucked in amongst the clementines. And blue and white china, of course! The Christmas china is packed away until next year. Christmas Day dinner is the last time we use it. It's tradition. The china is English and although there are some other colors it is mostly blue and white. White napkins in the silver napkin rings. My hotel silver knives and forks. It's a simple table for a luncheon during this week between. But after the excess that is Christmas, it is good to do things in a simpler way. It's Thursday, so please join Susan at Between Naps on the Porch and see how everyone has set their table this week! I so love Thursdays and seeing everyone's pretty dishes and centerpieces! Although it does snow on the prairie in the winter, for the most part winter is brown not white. Christmases, too, are rarely white on the prairie and so when Thursday we got first rain, then sleet and finally snow, the White Christmas that everyone yearns for came to be. The breakfast room looks out over the back garden and it was transformed from winter brown to winter white. 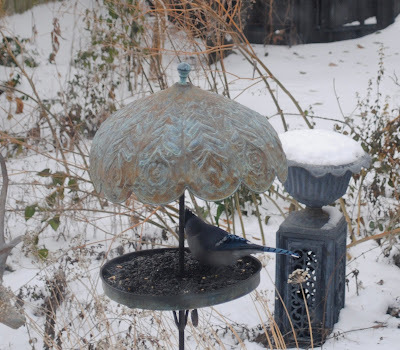 We have several feeders at Linderhof as well as a heated bird bath. 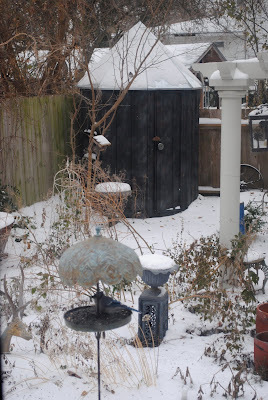 The potting shed sits in the corner wearing a hat of snow. We throw seed on the ground for the ground feeders -- the juncos, the doves although other birds will also feed on the ground. 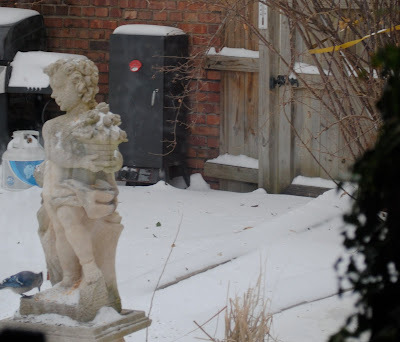 We enjoy the garden in all seasons but think that the winter garden with it's covering of snow is magical. Please join Susan at A Southern Daydreamer to see other great outdoor posts on this Outdoor Wednesday. 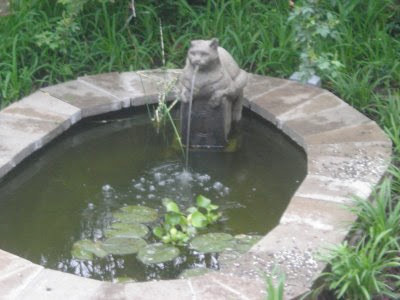 The pond in summer - with the cat fountain sprewing water and goldfish swimming below the surface . . .
Transforms into frozen snow covered tundra. The goldfish are somewhere in the depths of the fountain. And the cat has been put out for the winter! Quite a transformation from summer scene to winter scene! 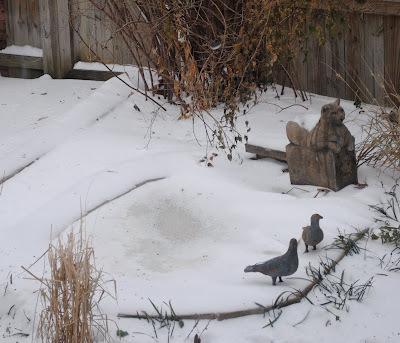 And with the ice and snow covered ground, the birds have been flocking to the garden. 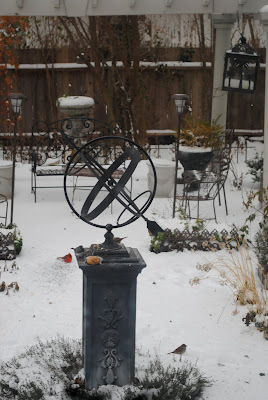 Cardinals, juncos, chickadees, an occasional goldfinch and tufted titmouse. Herr Squirrel, too, has managed to get a meal or two. 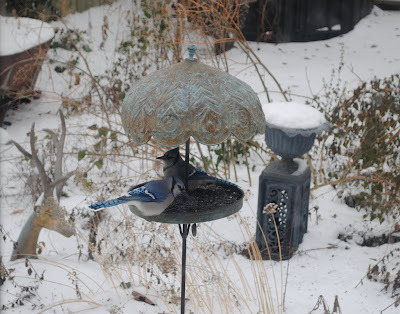 But a favorite of ours is the bluejay. 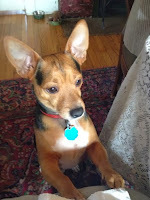 This fellow is working hard for his sunflower morsel. While at the feeder, a fat (and sassy) Jay is eating his fill. Although Jays can be raucous birds, they have a soft spot in my heart. My high school mascot was the Jay and so I've always held them dear. And what can be better than one Jay -- two Jays! Summer or winter, I love to see the blues of the jays flit from tree to feeder and back again. Blue is always a favorite color in the garden -- whether it's feathers or petals! It's Monday, and so I thought a Jay post would be fitting. Visit Smiling Sally and see what other blues there are this Monday. It's also Met Monday at Between Naps on the Porch. 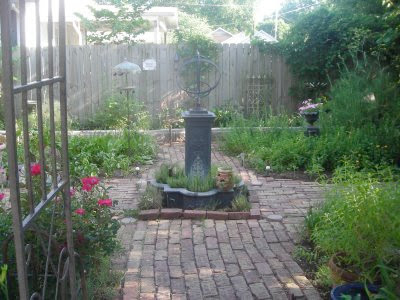 I can't think of a better metamorphosis than the transformation of the garden from summer to winter. Please join Susan and see what other transformations there are this Monday. All is Calm; All is Bright . . . I love the quiet of this, the day after Christmas. The presents are unwrapped. The company's come and gone. Quiet descends on Linderhof. Presents are put away in their proper places. Christmas papers and ribbons and boxes are taken to the attic until next Christmas. And after breakfast and a tidying up of downstairs, you will find me in the breakfast room. With the last of the breakfast coffee. And one of the Christmas candles burning to bring the fragrance of pine indoors. With my cards, my address book and a list of those friends or relatives who either were not here at Christmas and thus need a note to thank them for their gift or dear friends who need a note in addition to the personal thank you, I begin an annual ritual. The Christmas Thank You Notes. It's not a chore but a labor of love. To tell these friends how special both they are to husband Jim and I and to thank them for their kindness and thoughtfulness this Christmas season. There is something special about the week between Christmas and New Year's. Perhaps it is a memory of this "off" week from school during Christmas and New Year's. Perhaps it is the fact that the hustle and bustle of pre-Christmas is done and we can sit back and enjoy the tree, the greens on the mantle. There are still cookies in the larder for afternoon teas. Fruitcake and eggnog after dinner in the evenings. The Holiday Season is a special time and we relish this, the quiet week. Today is a rare day on the prairie. 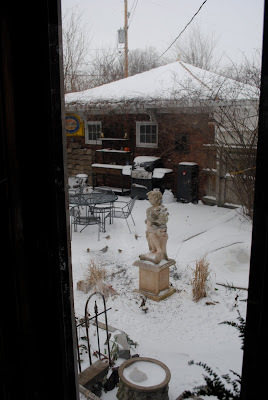 There is snow on the ground -- a Christmas snow -- and flakes are fluttering down. The birds are active and feeding heavily. It's a joy to watch their antics as I write my notes of thanks. Every December, I make sure to take some time for "me". It's a hustle and bustle of a season and one would get frazzled if one didn't make some time for oneself. Every December, I reread one of my favorite books, Winter Solstice by Rosamund Pilcher. Not plowing through but rather enjoying favorite chapters in this, my favorite of all Christmas books. And when I read, it's also time for tea and a nosh. Christmas cookies abound in the larder and a few are put on the tea saucer. Clementines are a part of December as well and I like to nibble on one while reading. It's a cozy spot in our bedroom -- with the chaise, a just right size table and a small oriental lamp. Winter potpouri permeates the room while Mr. Frog corals pins and needles for I often do hand sewing in this, a favorite spot. And since it is December, tea is taken from the Tartan cup and saucer -- with the smell or spicy potpouri and the Christmas china, it makes the bedroom seem festive. The chaise is from the 1920's and has a down cushion. It's the coziest spot upstairs! 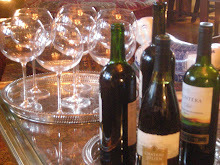 Please join Susan at Between Naps on the Porch and see what other tablescapes there are this Thursday, Christmas Eve. We love Christmas ornaments at Linderhof -- and have been buying them every year since the first few that we bought on our honeymoon 40 years ago. Most are dear to us, many are gifts from friends, some are from my childhood tree, some were brought back from a German vacation when Daughter Sarah was in high school. It's always a joy to decorate the tree and lovingly put the ornaments on. Some are so old that they only shine with sentiment! We love Christmas movies . . . the old ones -- Miracle on 34th Street, Holiday Inn, It's a Wonderful Life and Christmas in Connecticut. This Macy's ornament, a gift from Daughter Sarah reminds us both of the evenings that we sat and watched Miracle on 34th Street together when she was a small child. A Radko ornament -- the only one we have, but if you'll notice, it's not a snowman in the middle but rather the Pillsbury Doughboy! Another gift from Daughter Sarah who, since she works for General Mills, which owns Pillsbury, knows the Doughboy by his first name (and she won't tell us what it is!) This is a dear ornament and I hang it on the branch so tightly that it's hard to get off! It was one of those "Employee Only" ornaments -- available to purchase only by employees of the company! We love German ornaments and this wooden Santa is by Steinbach (which makes those great nutcrackers) . . . alas, no nutcrackers for us but we have about six different Steinbachs. Not bought by us in Germany but they do remind us of that trip. And one of our many Reed and Barton dated silver bells. The 40th Anniversary 2009 is now home and on the tree. It's a great tradition and like the first ornament, the silver bells are because of It's a Wonderful Life. We used to watch that movie over and over again each Christmas season. Daughter Sarah and I were always fascinated by the bells . . . for "everytime a bell rings, an angel gets their wings". And we do hear the bells ring . . . and we know -- another angel has received their wings! 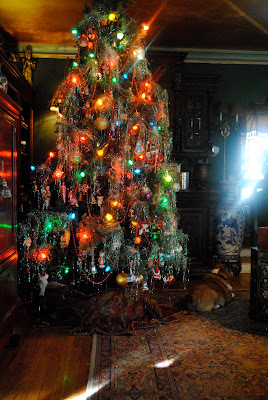 An old fashioned tree with old fashioned ornaments. Soon wrapped presents will be piled high beneath for it's almost Christmas. All too soon, those ornaments will go back in their boxes and back to the basement. To wait for another year so that for most of December, memories will abound on our Christmas tree. It's Wednesday, and time to join Susan at A Southern Daydreamer to see what everyone has been doing outdoors. With the blizzard in the East, I'm expecting (and hoping) for a lot of snow pictures! Snow makes it seem more like Christmas! These are not really sugar plums, but the Christmas cookies of Linderhof. We do have a recipe and have made sugar plums, but we don't do it every year but we do make Christmas cookies every year. As with my simpler decorating this year, my Christmas baking is back to the old favorites. The cookies I grew up with and the cookies I made for Daughter Sarah when she was small. The Peffernusse (or peppernuts). A spicy little cookie that has an anise flavor. Anise oil -- not extract -- goes into these cookies but, alas, no pepper! They're small cookies and they go so good at tea time! Daughter Sarah's favorite cookies -- the cutouts. With the Christmas tree cutter (I think, perhaps, because that cutter made the biggest cookies!) Simply done with a sprinkle of green sugar. Bourbon bites -- not really a cookie but a small cake filled with golden raisins, nuts and bourbon. Topped with a candied cherry, they're a yummy Christmas treat. Most of our cookies are given away to friends and shopkeepers and those we wish to remember with a little gift during this holiday season. We, do, however, save some to have with our afternoon tea. 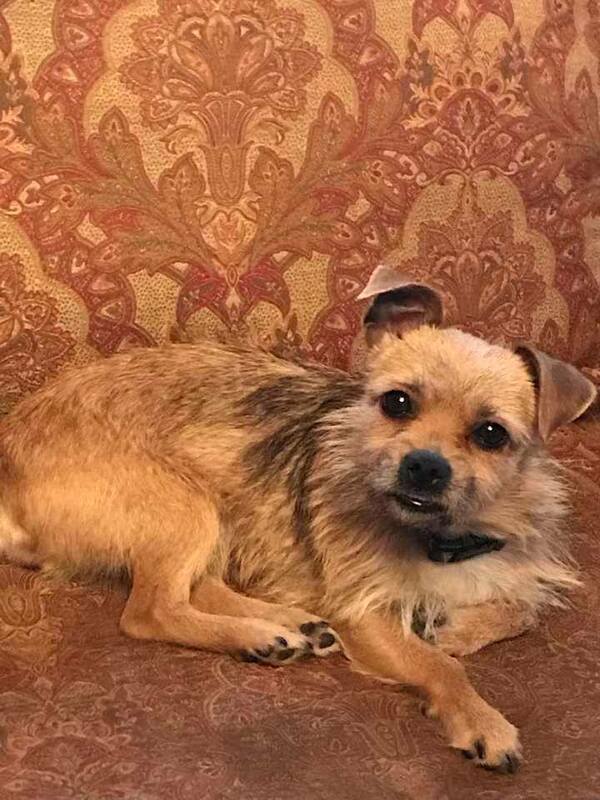 It's Tuesday and that means that it's time for "Three or More" -- visit Tam at The Gypsy's Corner to see what everyone has three or more of. I'm thinking that perhaps my three kinds of cookies may be the most delicious "Three or More" this Tuesday! You know of my love for blue and white transferware so naturally, my teapots would be blue and white. 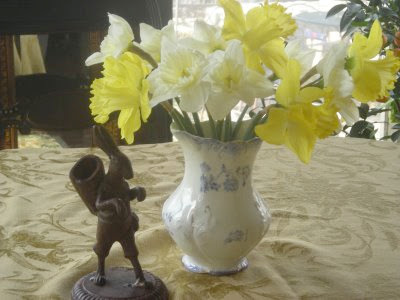 The old sideboard in the breakfast room is the perfect place for these treasures. Along with a Spode covered vegetable bowl. Behind the glass doors are my blue and white teacups and saucers. On the shelf below, a tea caddy. With a pot of water just to the boil, the breakfast room becomes a tea room! As much as I love the tureen on top, I yearn for a Spode Blue Italian one but they are so pricey that I will continue to yearn for one! It's Blue Monday over at Smiling Sally's. Stop by and see everyone's choice of blue! Christmas cards are an important part of Christmas. Channeling Martha Stewart, I decided to make my own cards this year . . . of course, December 15, is not the ideal time to start making one's own cards! After five, I'm back to using the boxed cards I found on sale last year. . . . 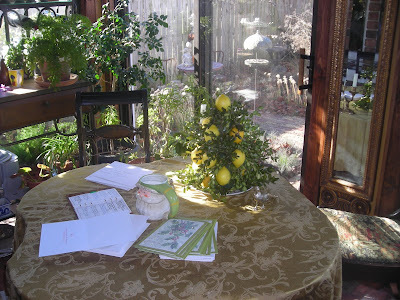 This post is from December 7, 2008 -- Christmas card addressing a bit earlier than this year! 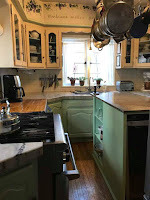 It's time for Sunday Favorites at Happy to Design so please join Chari and see other favorites on this busy (and for some, snowy) Sunday! In the hustle and bustle of this Christmas season, oftentimes lunches are "grab and go". But no fast food for us. Rather a simple and comforting lunch. A childhood favorite updated to our adult tastes. Cream of tomato soup and grilled cheese! Not canned Campbell's but rather (for speed) boxed Pacifico with the addition of roasted red peppers. We "jazz" it up a bit with real cream and there is always a box or two in the larder for those busy days when you definitely want a quick lunch! The grilled cheese on wholegrain bread. Grilled to perfection. Grilled cheese and cream of tomato soup is a match made in heaven, whether for those busy December days or the colder and snowier January ones. It's a great comforting lunch. It's Finally Christmas at Linderhof! It Was a Wonderful Anniversary. . . .